This is Not Babe Ruth’s Piano. Legend has it that Hall of Fame slugger Babe Ruth, frustrated after a tough day at Fenway Park, tossed a piano into a lake in suburban Boston. That piano has never been found. But Fenway Park will be filled with the sound of piano music during its 100th Anniversary Celebration, thanks to M. Steinert & Sons, the nation’s oldest music store. 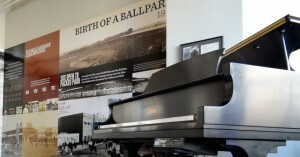 M. Steinert & Sons has placed a Steinway-built Boston Grand Piano in Fenway Park’s “Royal Rooters Club” for the duration of the anniversary year. Red Sox fans can enjoy renditions of their favorite songs both old and new. The ebony black Boston GP163 grand piano also features an innovative PianoDisc system that plays the piano remotely.